PHOTO BY JILL GOSCHE Cyle Carter addresses Seneca County Common Pleas Court Judge Steve Shuff as he stands next to his attorney, Adam Stone, Friday morning. 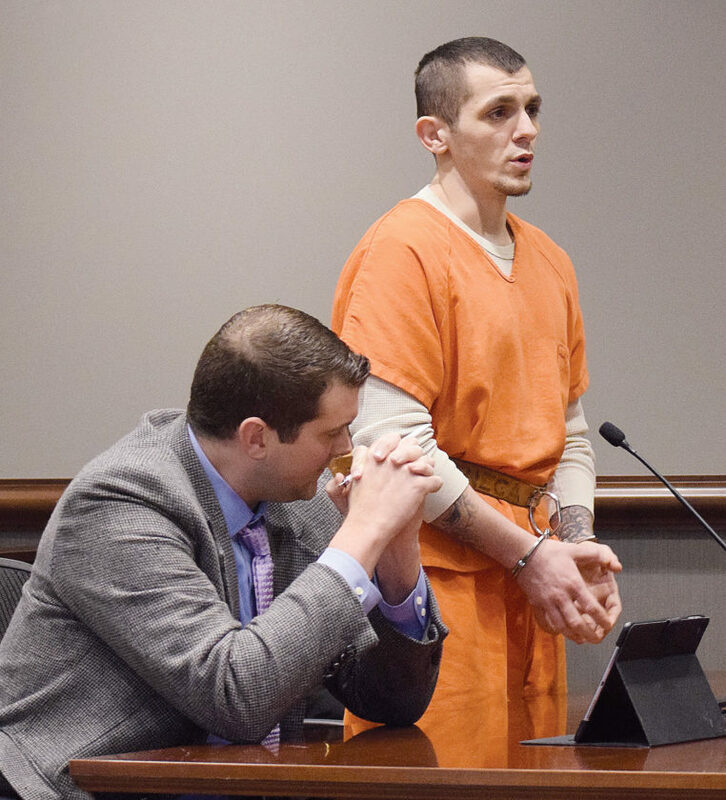 A man convicted of two charges during a jury trial this week was sentenced to 10 years in prison by Seneca County Common Pleas Court Judge Steve Shuff Friday morning. Cyle J. Carter, 28, of Tiffin, had been found guilty of aggravated burglary, a first-degree felony, and felonious assault, a second-degree felony, and was found not guilty of assault, a first-degree misdemeanor. Shuff sentenced him to 10 years in prison, with credit for 117 days served. Prior to sentencing, Shuff said lessons had not been learned. “Treatment has not worked,” he said. Cyle Carter and Robert L. Norville Jr., 41, and Robert L. Norville III, 19, both of New Riegel, all were charged with aggravated burglary, a first-degree felony; felonious assault, a second-degree felony; and assault, a first-degree misdemeanor, after an incident Nov. 14. Court records state Cynthia A. Chilcutt of 686 S. Sandusky St., Lot 80, reported the three men broke into her trailer and assaulted Edward F. Carter Jr. She reported they “busted open” the front door and shoved her into a wall as they rushed by her to get to Edward Carter Jr., records state. Angela Boes, assistant Seneca County prosecutor, said the victims were afraid Cyle Carter would come back for them again. Edward Carter Jr. had tried to help his nephew Cyle Carter, did nothing to induce or facilitate the offense, and was totally blind-sided and beaten, she said. “The offender’s relationship with the victim facilitated the offense,” she said. Boes said Cyle Carter showed no remorse and seemingly felt he can do whatever he wants. “He’s continued to deny responsibility,” she said. Adam Stone, Cyle Carter’s attorney, said Cyle Carter is a young man who comes from a long line of addicts and people who have seen prison as almost a rite of passage. Cyle Carter said he had been in and out of trouble his entire life and had made horrible decisions. He told Shuff that every time he gets in trouble and appears before Shuff, he explains what happened and tells Shuff what he did. “You’re fair with me every time. … Sometimes I don’t like it, and I go to prison,” he said. An attorney is to be appointed for appeal purposes. A jury found Robert Norville Jr. guilty of felonious assault, a second-degree felony, and not guilty of aggravated burglary, a first-degree felony, and assault, a first-degree misdemeanor, during a trial that ended March 6. Robert Norville Jr. then pleaded guilty to charges of failure to comply with an order or signal of a police officer, a third-degree felony; assault, a fourth-degree felony; and desecration, a second-degree misdemeanor, March 21. He was the driver of a 2002 Chevrolet Avalanche that led law enforcement officers on a pursuit Dec. 4 in Tiffin and Hopewell Township, according to Seneca County Sheriff’s Office and Tiffin-Fostoria Municipal Court. His sentencing is scheduled for April 23. Robert L. Norville III’s trial is next week.